Are you the type of person who likes to go to the movies for sheer, thoughtless entertainment? Is your favourite movie of all time Rambo? Was the plot of Charlie's Angels are real brain teaser? If you answered yes to all these questions don't bother reading on. 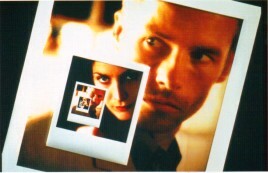 Because Memento is a film not only not for the faint of heart, but definitely not for the faint of mind. Fun in the same way that a fifty page algebraic equation is, Memento is a film that really should be seen, mainly because of the answer you will find on page fifty. But what is it that makes Memento so challenging? What makes it that much more special than every other crime noir flick out there? What makes this perhaps the first MUST SEE film of the year next to Moulin Rouge? Well by now if you are wondering why this review up to this point is a little bit of a confusing litany of rhetorical questions, perhaps you may be beginning to feel the same way you will whilst watching the first thirty minutes of Memento . The first perplexing aspect of the film is that the story is told backwards. Yes, you heard me correct, sdrawkcab. But don't be discouraged because this is overcome very quickly and actually adds a degree of intellectual 'fun' to the proceedings. At the end of each scene we then see the end of the scene that came before, if you get what I mean. Well, you will. And from here the 'different' aspects of the film continue. This basically comes down to the plot. The plot involves a man (played by former Neighbours star Guy Pearce) who is out to avenge the murder of his wife. The film opens as the character kills the person who killed his wife (?) and then backtracks to how we got to that point, and the different thing is that the explanations of what happened and the whodunnit 'twist' (if you want to reduce this masterpiece to that shallow level) comes at the beginning which comes at the end. Confused? You will be. And to add salt to the wounds, or cream to the cake depending on how you look at it, Pearce's character can not remember anything after two minutes of learning it, from the moment his wife died. He remembers everything that came before that. With a plot as ingenious yet confusing as this film has, it would be very easy for a director to ruin the film with over zealous and incomprehensible direction. However, director Christopher Nolan knows how to let us absorb all the complexities. He has a calm way with cameras and just lets us view what is going on without thrusting it in our face. Of course he is assisted by a fine cinematographer who knows just how to provide the right atmosphere, a great script and a very capable group of actors. Carrie-Anne Moss is particularly good in what I thought was the most interesting role in the film. Her character is complex and her performance affecting. There is one scene where she will have you absolutely riveted. See the film and you will know exactly what scene I refer to. So I know what you are thinking. I am meant to be a critic. I am meant to criticise. But truly this is a film that escapes criticism. If I was to search really hard for any criticism it might be that it will eat up twice the amount of money you might pay for another movie, simply because it must be seen twice. There are so many little details that need to be picked up that a second viewing is almost a requisite. Another praise for the film is that you will WANT to see it a second time, perhaps even a third. It is a movie that will inspire debate and discussion and will just generally have you gushing. So how does it compares to this year's other must-see movie, Moulin Rouge ? Well, whilst Memento won't score as high as Moulin in my ratings, that does not mean it is a lesser film. It just isn't as balls-to-the-wall non-stop adrenaline pumping entertainment. It is a slow burner, but the dish you wait patiently for will satisfy even the wildest of hungers.